The e-commerce space is continuing its relentless growth. It is a segment that has made such irrevocable change to consumer buying habits that it is hard to imagine life without it, or frankly what life was like before the convenience. Given the rapidly shifting nature of the industry, from demographics to customer needs, preferences, and behavior, it’s clear that the market will continue evolving this year as well, with an unwavering focus on enhanced value and innovation. E-commerce will continue to grow exponentially; mid-market businesses will gain share. E-commerce is already a massive industry and it’s only going to get bigger given the remarkable convenience it affords consumers. E-commerce sales numbers, as well as online share of all purchases, will continue to grow this year. 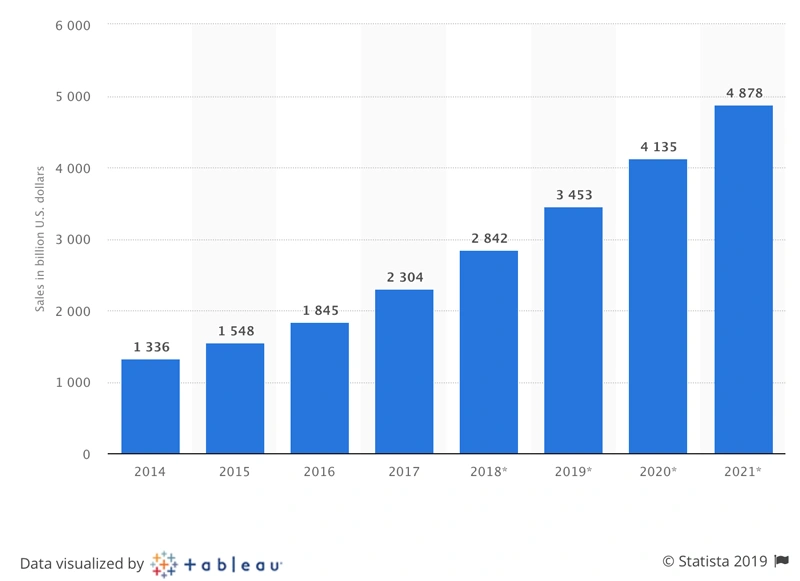 According to Statista, global retail e-commerce sales will exceed $3 trillion in 2019. A large part of this growth will be driven by emerging economies like China, India, and Brazil. While Amazon will continue to be the dominant US player in 2019, mid-market e-commerce businesses will see market share growth in specific geographies, verticals, and categories. Online merchants that cater to the niche requirements of a specific customer base, and focus on delivering a unique user experience will emerge victorious in their battle against the likes of Amazon. B2B e-commerce will grow faster than the B2C e-commerce market. The B2B e-commerce market will experience unprecedented growth in 2019. More and more B2B vendors will scramble to create an online presence, which will include securing listings on marketplaces (if they haven’t already). A key reason for this is that an increasing number of B2B buyers and researchers are millennials that are not only tech-savvy, but expect the same convenience and personalization that they’re used to on consumer websites. Shoppers will opt for cross-border purchases; payments will continue to see disruption. As geographical boundaries thin out, merchants can expect a growing number of purchases from a truly global audience as consumers look beyond these limitations to find the best solutions for their needs. E-commerce vendors will need to offer the same convenience, benefits, and experience (as in their primary geography), regardless of location. 24×7 payment systems and global delivery will become inevitable. Retailers and e-commerce giants globally are lobbying for always-available payment systems. They want credit card payments to be credited instantaneously, even for purchases made during the night (post-business hours of financial institutions). This would be a welcome change for the industry, and one that could have a significant impact on a merchant’s cash flow. Mobile commerce will be more than 50% of all e-commerce globally. Mobile commerce (or m-commerce) made up 40% of e-commerce sales in the US alone in Q3 2018, according to an industry report. However, in many other countries that share increases to 50% or more, with Sweden leading the way at 60%. In 2019, we expect that online shopping on mobile devices will exceed 50% of all retail e-commerce transactions globally. Optimizing content, images, and infrastructure for mobile shoppers will be key to delivering great user experiences across all platforms. Subscription-based models will gain traction. Online merchants in the healthcare, personal styling, grocery, and e-learning verticals will increasingly adopt subscription-based e-commerce business models. These vendors will offer shoppers more personalized, convenient, and lower-cost buying options, as well as superior end-to-end experiences. The focus will be on reducing customer churn. Augmented reality features as well as visual and voice search will become mainstream Augmented Reality (AR) promises to make our shopping experiences smarter and more immersive. Consumers, especially in fashion, beauty, and perhaps, home improvement, that try it, like it, especially as a way to visualize how products would look on themselves and in their homes. 1 in 10 retailers say they have integrated AR into their marketing efforts already, according to data from the Boston Consulting Group; another 45% say they’re experimenting, and 35% say they have future plans to use it. New “snap and shop” features already rolling out allow users to merely take a photo of an item to find it online and subsequently buy it a few seconds later. In February last year, there were over 600 million visual searches on Pinterest each month. In a partnership with Amazon, Snapchat announced it was testing a new tool allowing users to take a photo of a product or barcode and, if recognised, launch an Amazon product page to learn more and (hopefully) make a purchase. Google announced the integration of its AI-driven Lens into searches. We expect massive adoption of visual search capabilities in 2019. Voice search adoption will grow significantly as well. According to an industry report, 27% of the global online population is using voice search on mobile. 34% of internet users say they are interested in purchasing a voice-controlled smart assistant, and we are already seeing a tremendous surge in smart speakers as an indicator. Estimates suggest that purchases made through voice search devices will rise to $40 billion by 2022. The improvements online merchants make to their storefronts by incorporating these technologies will make it easier than ever to locate, browse, compare, and purchase just about anything from anywhere. This seamless user experience needs to be supported by a scalable, cloud-based infrastructure, which is ready to serve many different kinds of content fast, and under any traffic conditions. Majority of the mid-market will be “cloudified”. When it comes to hosting, the cloud is the ideal home for e-commerce. The public cloud’s utility-based model is extremely well-suited to the rise and fall of demand across global markets. The low end of e-commerce is already very “cloudified”, and so is the highest end (brands such as Amazon and Walmart). However, this is not the case with the mid-market, where merchants are typically hosted in static, managed hosting environments where they are severely limited in terms of scaling, performance, security, and automation. The fact that massive brands like Barneys and Lowe’s still have downtime issues and scaling challenges during their most important shopping seasons shows the gap. This is set to change in 2019 as the vast majority of these mid-market businesses are migrating to the cloud. These online merchants are currently evaluating solutions to improve uptime, performance, and security, as well as to simplify their infrastructure and lower costs. Merchants will work with different specialists for site development and infrastructure. Cloud experts rarely understand specific code platforms, and developers cannot possibly comprehend the 20,000 APIs published by global cloud providers. Online merchants are becoming increasingly aware of the limited scope of their relationships with their developer teams and partners in managing site infrastructure as they struggle with downtime, site slowdowns, and cyber attacks. In 2019, they will prefer working with different experts for their coding and infrastructure requirements. Development agencies are also growing tired of managing site infrastructure for e-commerce companies (which often results in poor customer satisfaction), since this is not their core skill set. In 2019, they will look to partner with proven cloud-based infrastructure experts to enable their customers to create unmatched user experiences. Site performance will matter more than ever. Site performance (page load times) is critical in e-commerce. An improvement can significantly enhance user experience, brand credibility, conversions, search rankings, and ultimately, revenue. Online merchants that are really serious about their business will continue to make investments in improving site performance in 2019 across all devices, especially mobile. Online merchants will become increasingly paranoid about cybersecurity, and rightly so. Sophisticated cyber criminals are no longer trying to bring down sites by launching DDoS attacks, for the most part. Instead, they’re trying to quietly steal identities and credit card information, and the attacks are becoming more sophisticated and malicious as a result. In 2018, we saw a huge malware attack that impacted about 5,000 Magento Open Source users. The Marriott Starwood data breach that leaked details of 500 million customers is unquestionably one of the largest data breaches in history. Most cyber attacks today are being executed via bots/botnets. These bots are constantly surveying the entire e-commerce universe for exploits, both known and new. They are using machine learning techniques to mimic human behavior and therefore, avoiding basic detection systems. As such, there needs to be a major focus on enhancing cybersecurity in 2019, and we expect to see merchants investing in sophisticated cybersecurity measures such as next-generation web application firewalls (WAFs), file integrity monitoring, DDoS mitigation, and machine learning based bot management. E-commerce is an extremely competitive space. To leverage the massive growth opportunities and beat competition, merchants need to constantly stay ahead of these trends, and ensure the best shopping experience across all devices and platforms. For this, they must invest in the right infrastructure solutions. However, making the right choices can be a daunting task for many. We run more than 1,000 online stores across 7 countries, and we can provide you with a free assessment of your current site infrastructure, as well as insights on where you stand versus your peers/competitors in 2019. Just fill out this form or email us at sales@webscalenetworks.com.